U2 have just released three never before seen interview clips on MySpace Music, AOL's Spinner, and The Wall Street Journal to coincide with the 25th anniversary of their creative breakthrough release, The Unforgettable Fire. The largest rock band in the world sat down to discuss their favorite tracks from the album, what they really thought of their biggest single at the time, "Pride (In the Name of Love)," and what it was like working with Brian Eno and Daniel Lanois for the first time at Ireland's Slane Castle for the making of this landmark album. 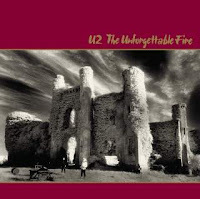 The recently re-mastered version of The Unforgettable Fire is now available everywhere in limited edition 2CD+DVD box set, 2CD deluxe edition, single CD and LP vinyl. Watch each video in its entirety to learn something new about the band and make sure to check out www.U2.com for the band's most recent tour dates.